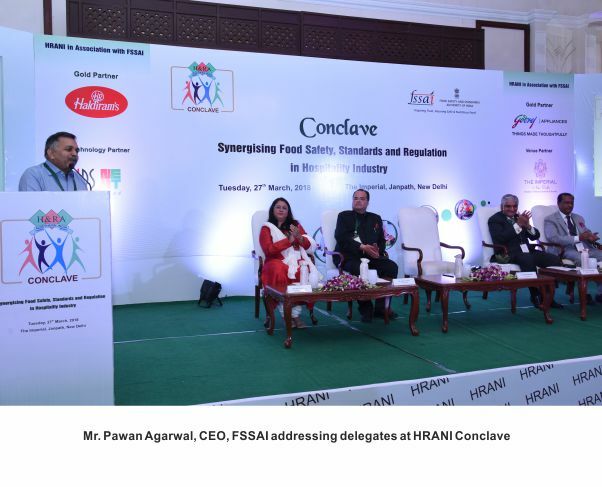 While addressing the ongoing HRANI Conclave emphasized on the role of catering sector in ensuring health of citizens by ensuring safe food to the consumers, Mr Pawan Agarwal, CEO, FSSAI highlighted the reforms by FSSAI for ease of doing business for catering sector. 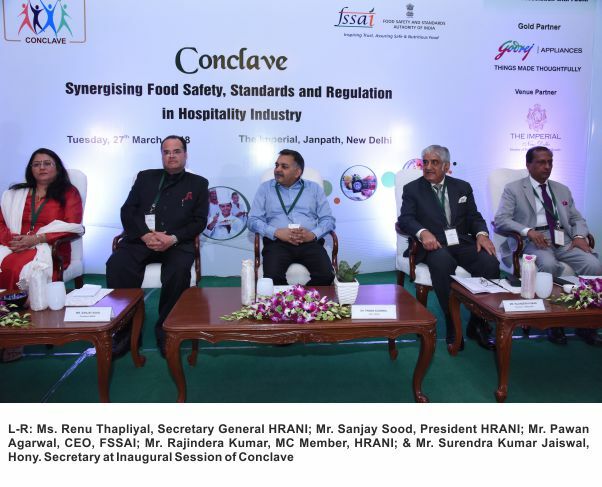 Also, modifications have been made in the Schedule 4 of FSS Regulations (Licensing and Registration of Food Businesses), 2011 where a separate section has been made for catering sector. 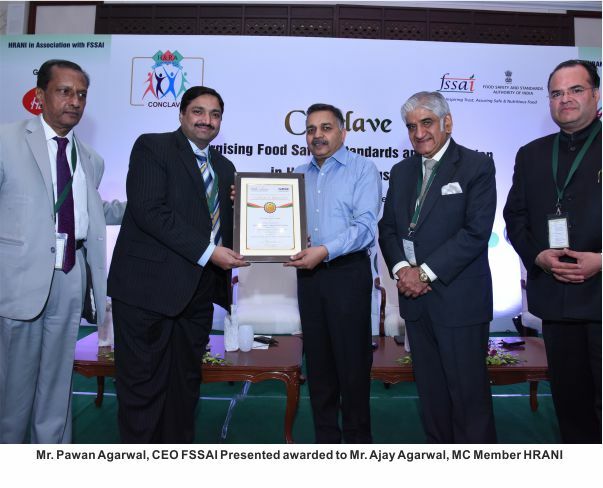 Under Schedule 4, FSSAI has laid the Good Hygiene and Manufacturing Requirements for the Food Business. 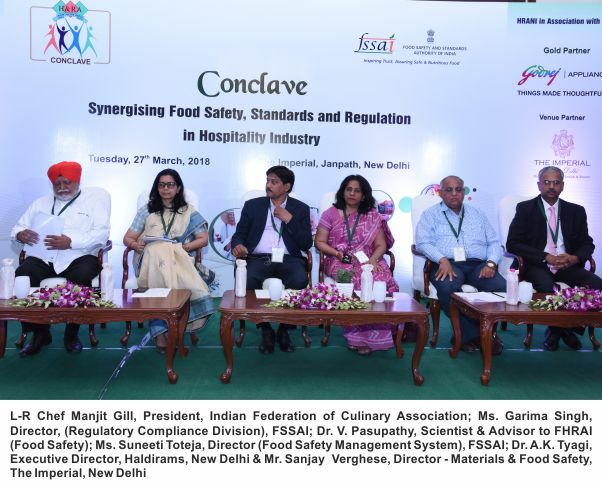 Earlier, a common Part II of schedule 4 was applicable for all food businesses applying for FSSAI License creating a lot of confusions in the catering sector. 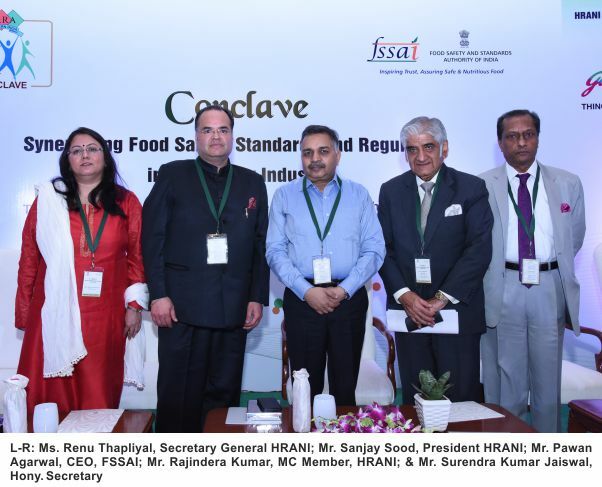 He also mentioned about the new draft regulations of FSSAI which will provide provision for recognizing laboratories of associations and food businesses for testing food samples for surveillance purposes. 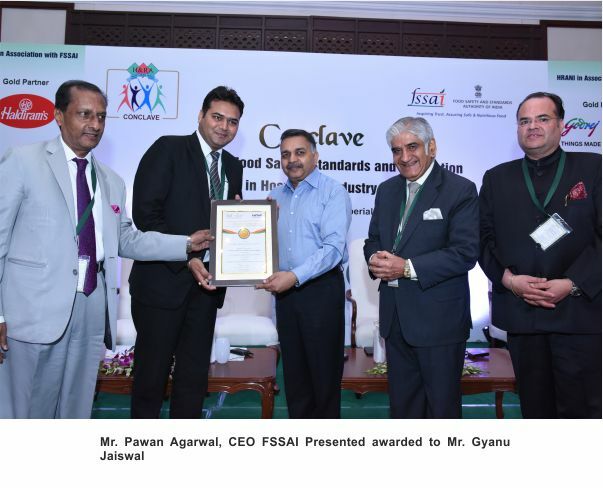 During his address CEO, FSSAI threw light on ‘Save Food Share Food Share Joy- an initiative for prevention of food loss, food waste and donation of food. 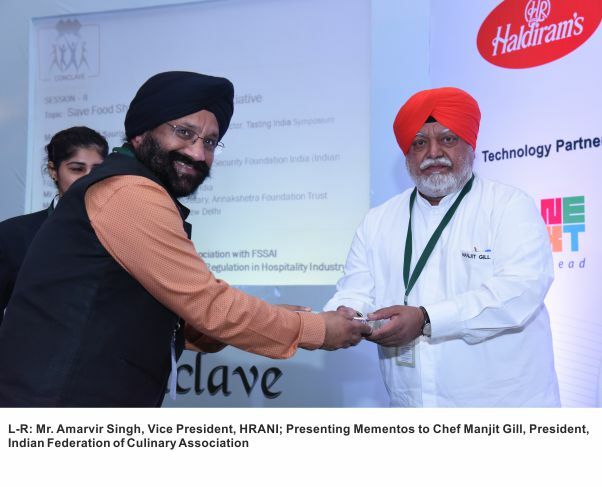 He urged catering sector to share food for the needy and help in prevention of food loss. Sh. 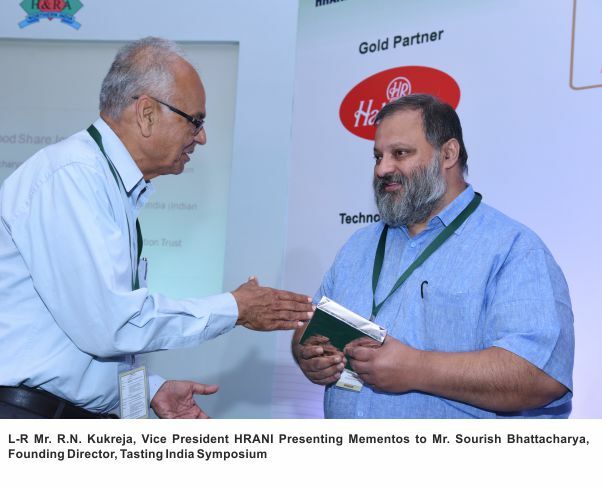 Surendra Kumar Jaiswal, Hony Secretary, HRANI in his address said that “The industry is indeed receptive of new draft regulations of FSSAI which will provide provision for recognizing laboratories of associations and food businesses for testing food samples for surveillance purposes”. 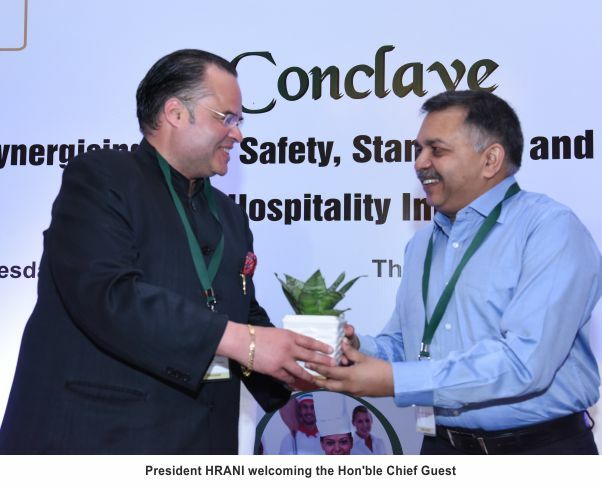 While thanking CEO, FSSAI he submitted that the hotel and restaurant industry purchases and procures the material from suppliers and prepares the food for guest service which leads to no direct involvement of food handlers in terms of quality of material procured. It should be taken in consideration and self-audit should be allowed and accepted by enforcement team. 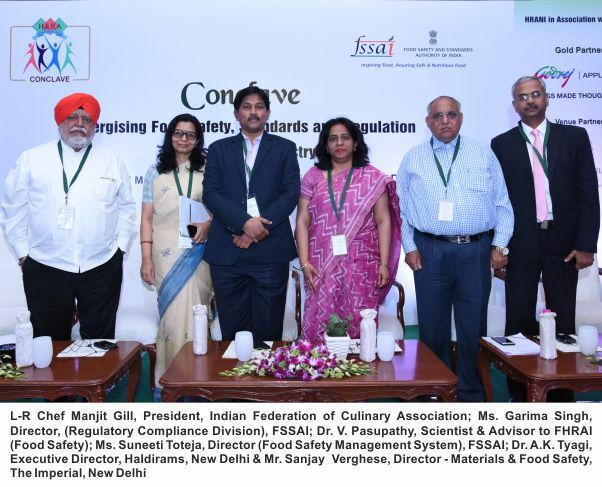 The Moderator of the first session was Dr. V. Pasupathy, Scientist & Advisor to FHRAI (Food Safety), & the panellists were Ms. Suneeti Toteja, Director (Food Safety Management System), FSSAI, Ms. Garima Singh, Director, (Regulatory Compliance Division), FSSAI, Chef Manjit Gill, President, Indian Federation of Culinary Association, Mr. Sanjay Verghese, Director - Materials & Food Safety, The Imperial, New Delhi, Dr. A.K. 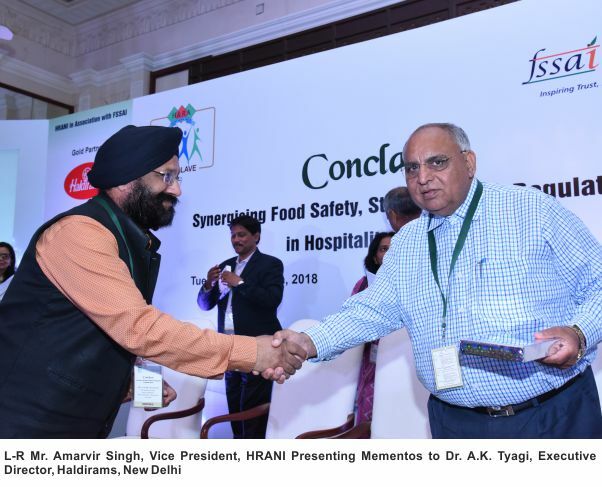 Tyagi, Executive Director, Haldirams, New Delhi. The session revolved around following key points. Separate section Schedule 4 i.e. 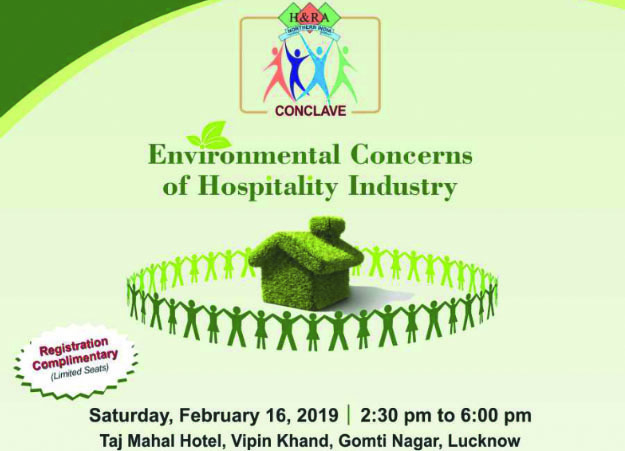 part V for catering sector. Now there is no overlap with Part II. 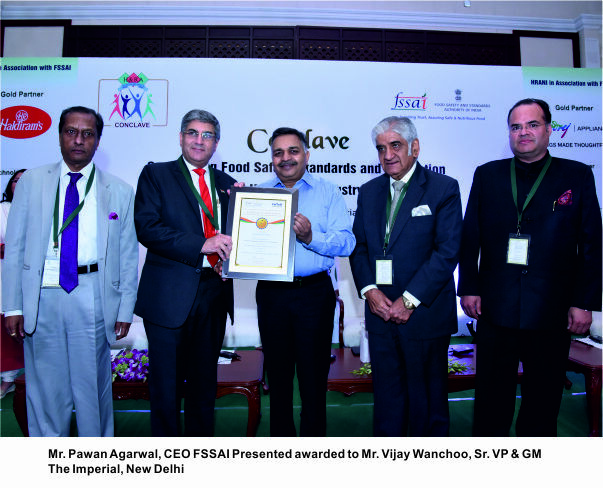 Trained Food Safety Supervisor in each premise to ensure a technical person is available for Food Safety implementation. Simplified inspection checklist for regulatory staff for more specific and relevant inspections. 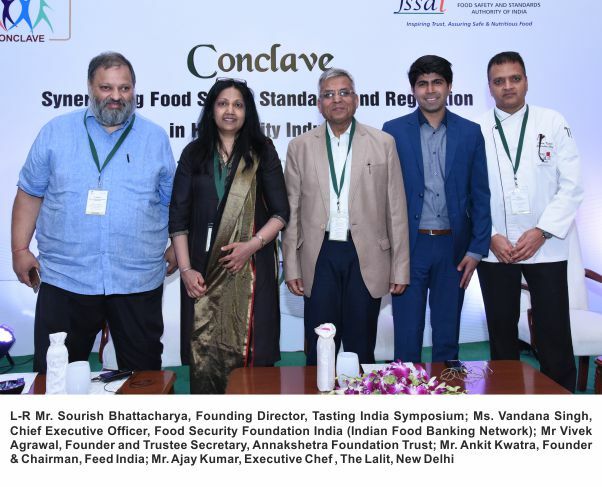 The session Save Food Share Food Share Joy highlighted the initiatives towards prevention of food loss, food waste and promotion of food sharing. 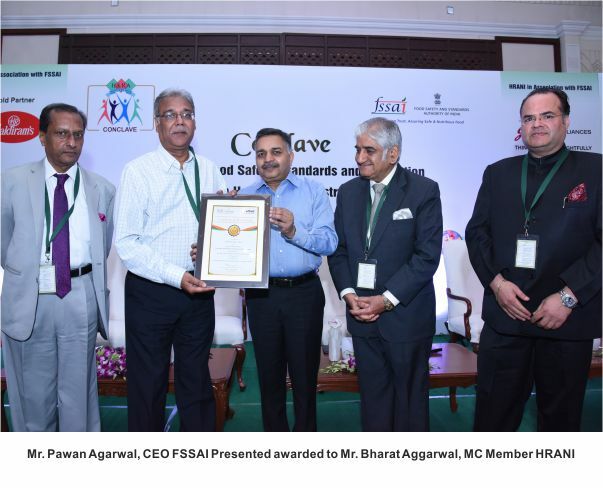 Major Food Collection Agencies of India of India have formed an alliance known as Indian Food Sharing Alliance (IFSA) which together to achieve a PAN India food donation for needy. I too have A Heart: Food Businesses and Citizens show a Big Heart by donating meals for needy in their own space. Also, a regulation for Surplus Food Recovery was developed. 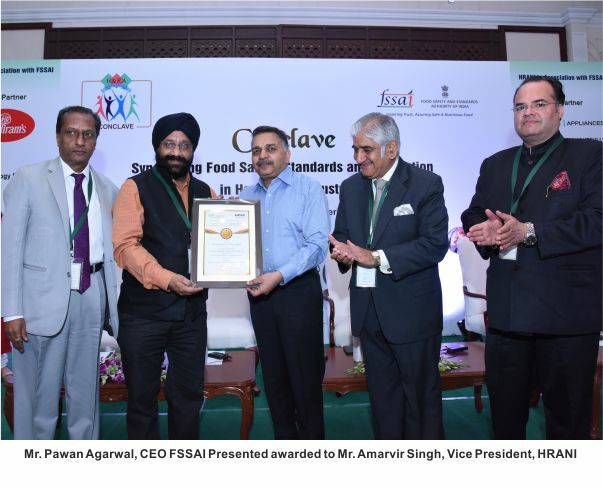 Catering establishments may register for Food Donation and can pledge to donate at least 100 meals per month for the needy. The Catering establishments may provide meals on subsidized rate for the purpose of food donation. 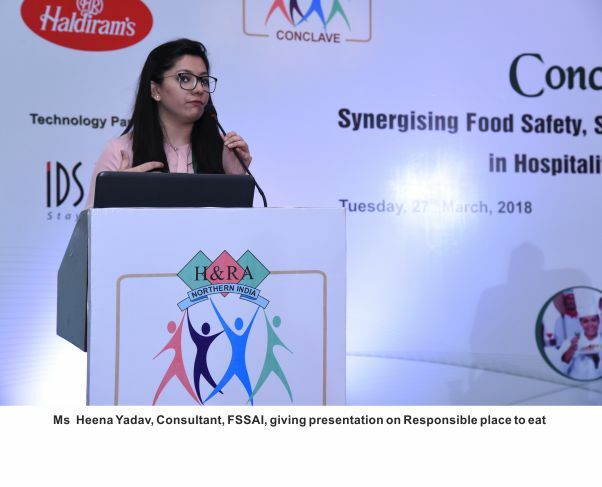 In case of surplus food, the FBOs can connect with IFSA for food donation. 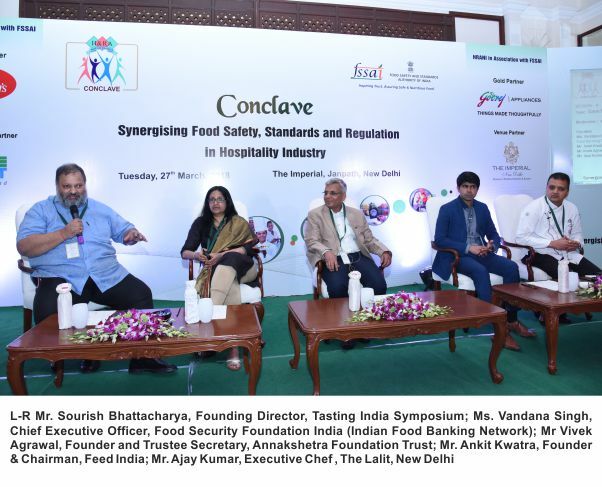 The Idea behind the panel discussion was to sensitize and motivate the participants about the initiative and about the agencies. Also, to encourage them on various ways they can participate. 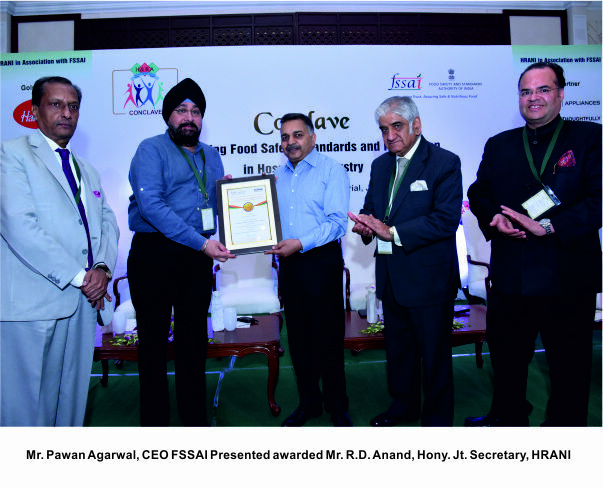 Following the panel discussion, a presentation on Responsible Place to Eat was done by FSSAI officials. 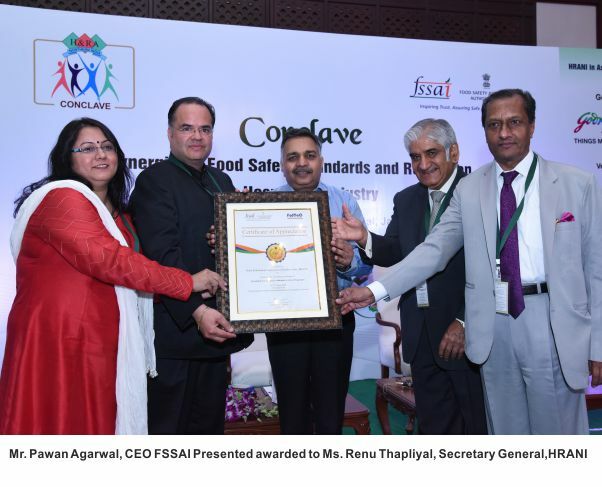 Hygiene Rating is a voluntary rating system to promote self-compliance of food hygiene and safety among restaurants and inform consumers about hygiene quality in the eateries. 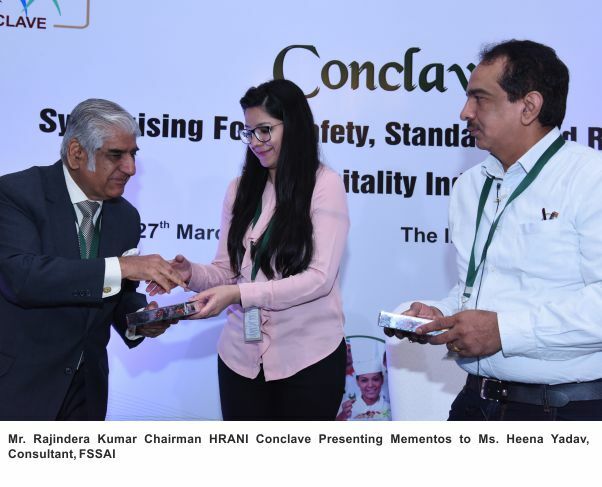 Recognizing the efforts of HRANI in organizing Food Safety Training & Certification (FoSTaC ) Program, FSSAI felicitated the members of the Association who have supported HRANI in holding the FoSTaC programs in various cities of Northern India. 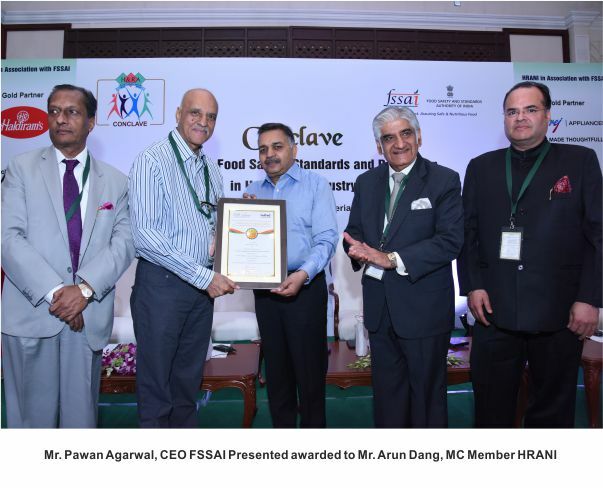 Following members of HRANI were awarded by CEO, FSSAI. 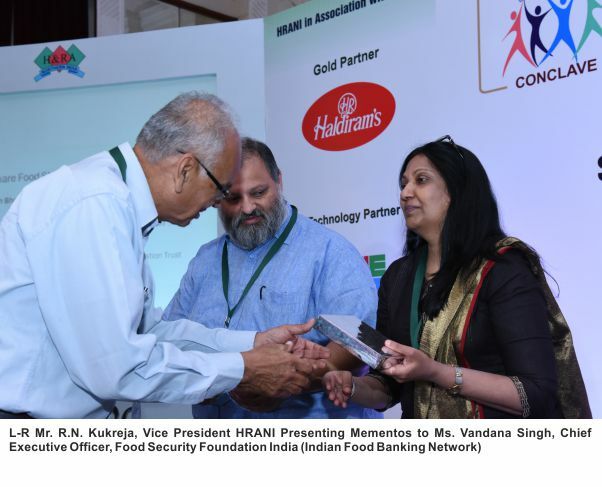 A special award of appreciation was given to Hotel and Restaurant association of Northern India as training partner. The event was well attended, with much networking and activity during the Q&A sessions. About 150 members were present for the same. 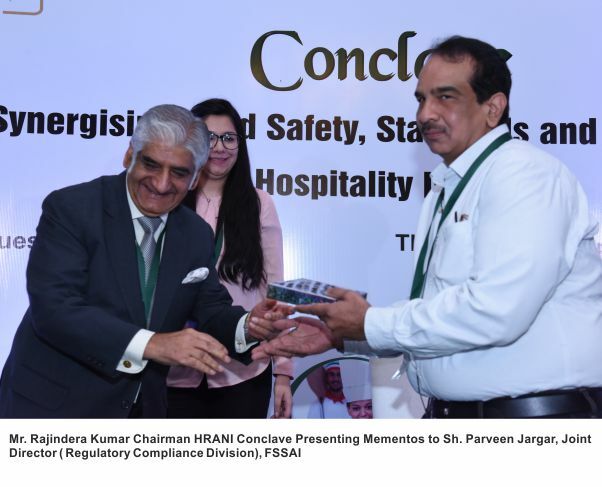 The Conclave was supported by sponsorship by Haldirams and Godrej as Gold Partners; The Imperial as venue Partners and IDS as Technology Partners.